Location: From Sydney: Hume Hwy, Wombeyan turnoff south of Mittagong, Mittagong-Wombeyan 65 km/90min. Also: Hume Hwy, Goulburn turnoff north via Taralga, Goulburn-Wombeyan 86 km/1 hour. Open: Open every day from 8:30. Fee: Adult $5, Family $12,50. Two Cave Concession (Fig Tree plus any other) Adult $10, Children (5-16) $5, Family $24. Classification: Karst cave, cave system, river cave. Guided tours: Guided and self guided adventure tours are available. Bibliography: H Jane Dyson (ed) et al. (1982): Wombeyan Caves, SSS Occasional Paper No 8. Published 1982. SSS. Address: Wombeyan Caves, P.O. Box 18, Taralga NSW 2580. Tel: +61-48-43-5976, Fax: +61-48-43-5988. Michael Chalker, Superintendent. Image: entrance hall of Fig Tree Cave. 1828 discovered by the Macarthur party. 18?? First entered by the Reverend Denning (creek section). 1906 opened for public inspection. 1968 reopened after considerable construction work, electric lightning. 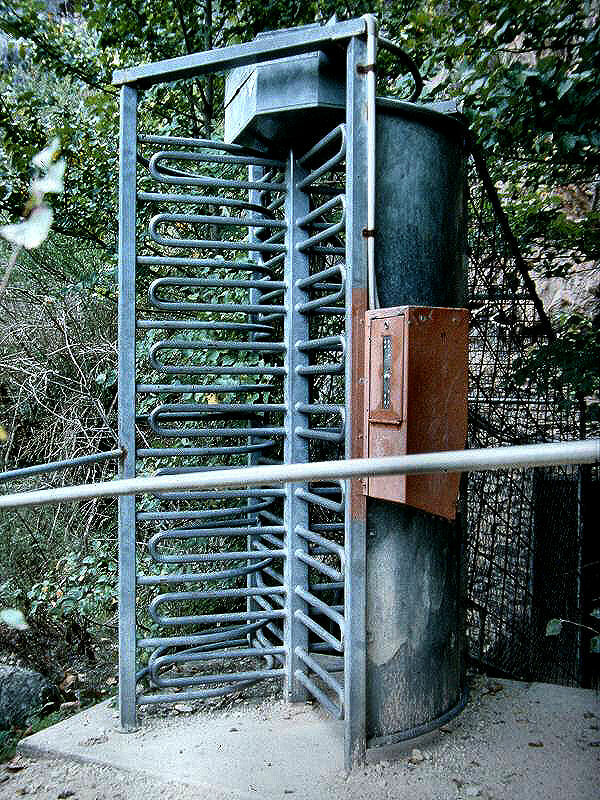 Image: you enter the cave through an automatic turnstile using your token. 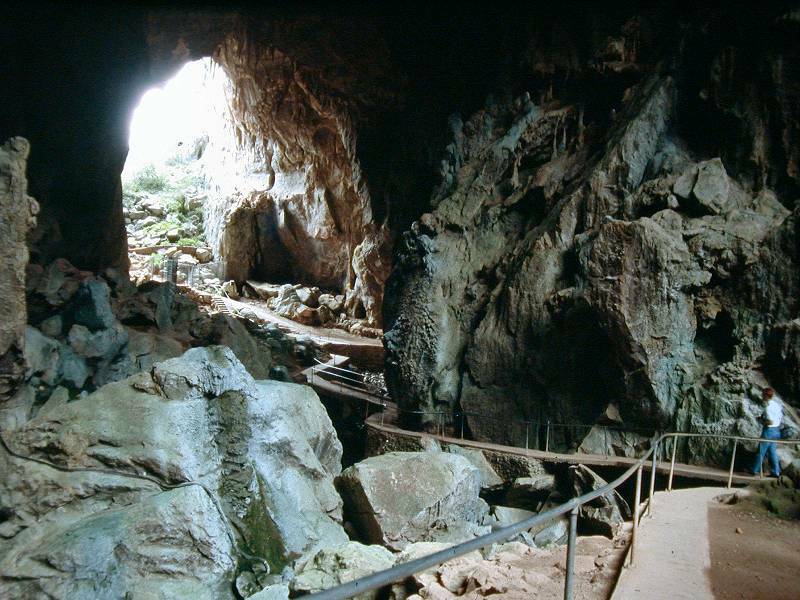 Fig Tree Cave is a selfguided cave, after paying the entrance fee you get a token. Then you walk 20 minutes to the entrance of the cave. At 5 points on the tour of inspection there are simple press button switches which operate the speakers. This is the only equipment you are required to use. Please keep to the formed pathway. Please refrain from smoking and from touching any part of the cave formations. Please do not drop any litter in the cave. Director, N.S.W. Department of Tourism. Text of the sign at the cave entrance. Now you enter the cave through an automatic turnstile using your token. The main benefit of the self-guided inspection is that you have no time-limit. There is a lot of time if you want to take pictures. The cave is visited sort of from the end to the start. You enter in a narrow passage which widens continually until you reach the grand finale. At the smae time you return underground from the 20 minutes away lying entrance to the center of Wombeyan Caves. 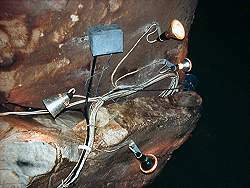 Fig Tree Cave has three different parts. The first part is inactive or fossil with nice formations. The second part is a narrow creek section. The third part is really impressive: the creek section leads to a huge cavern with several natural entrances. It is impossible to say if it is a natural bridge or a huge cave passage with many roof collapses. The natural light from different directions make artificial light unnecessary and gives this place a special atmosphere.